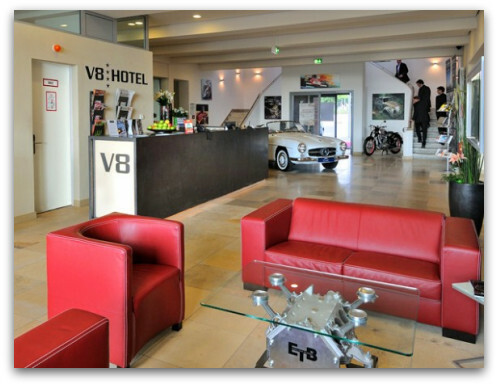 While surfing the web looking for cool bedroom ideas, I stumbled upon V8 Hotel in Germany. Car enthusiasts, brace yourself. 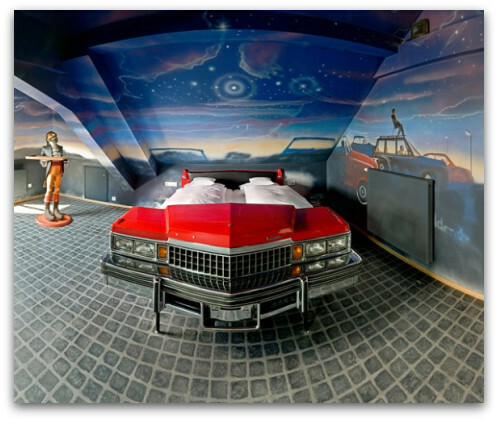 These decked out rooms will take you for a ride, literally. 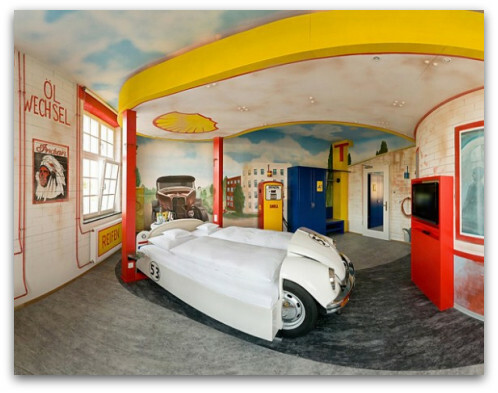 Each room is car themed, dating back to the 20’s, is fully loaded with wall murals so guests can envision themselves in a racecar game, and the bed and accessories are made out of real vintage cars! It’s a pretty bold move for a hotel—creating something so unique and specific. But upon learning that it was built near the German International Centre of Automakers, it made perfect sense. 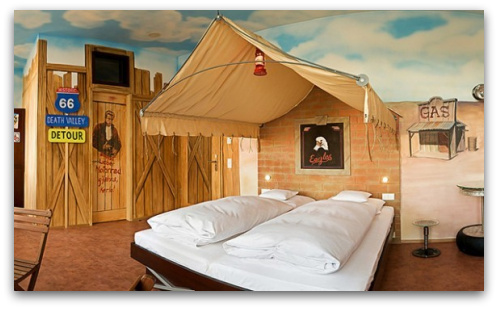 Check out these pictures and get inspired with cool bedroom ideas for your kid. 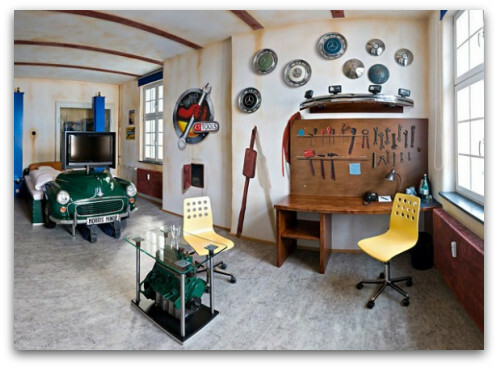 Pay attention to details and see how you can incorporate these unique car theme designs into your home. There is a whole range to chose from. 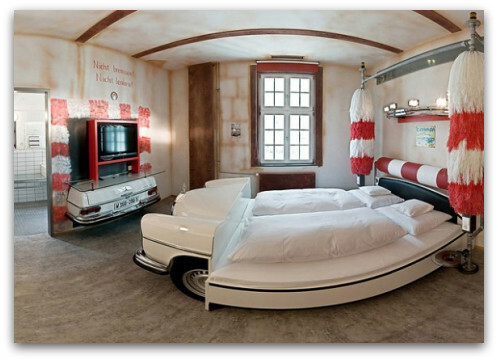 This room is called the AutoKino and its designed like a drive-in movie theater and features a Caddy bed. I especially like the wall murals which make you feel like part of a crowd. 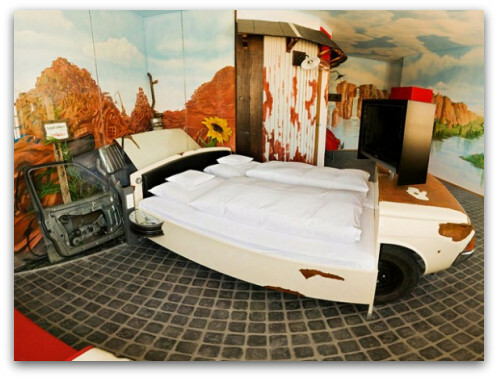 Then there is the Route 66 room. This one is outdoor-themed, with a swing and an old Western look. A biker’s paradise. One of my favorites is the Car Wash room. The best part is the feel that you’re actually zooming through a real car wash, with spinning brushes on each side of the old Benz bed and the back of a car serving as a TV stand. The Tankstelle room resembles a gas station, pump and all. The Nostalgie room looks like a junkyard full of precious finds. The Werkstatt room feels like you’re taking your car to the shop. It features a garage that has a Morris and mechanic’s legs.